Cornell Arms is a steel-framed eighteen-story apartment building with a red brick veneer. Constructed in 1949 by the regionally-renowned Southeastern architecture firm Lyles, Bissett, Carlisle, & Wolff (LBC&W), the modern International Style building was the first high-rise elevator apartment built in the Southeast using funds from the Federal Housing Administration’s Section 608 mortgage program. The building’s cross-shaped footprint, reinforced steel and concrete construction, flat roof, minimal ornamentation, and ground floor retail space are typical features of other FHA projects of the late 1940s and early 1950s. Cornell Arms is significant as a high-rise apartment building representative of the architectural response to the post-World War II housing shortage and need for higher-density, multi-family living arrangements. When completed in 1949, Cornell Arms was the tallest building between Richmond and Miami. 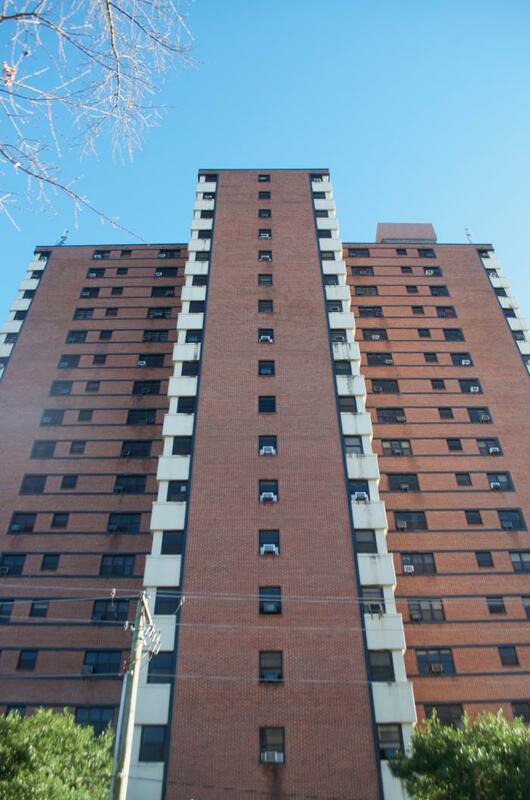 The FHA and City of Columbia alike praised Cornell Arms as a modern building ushering the city into its mid-century period of expansion and offering a new type of modern living. Cornell Arms is also significant as an excellent example of Modern architecture designed by the preeminent Southeastern firm of LBC&W. The International Style, mixed-use (commercial/residential) building expresses LBC&W’s early modern design philosophy and initiated the firm’s lucrative decades-long relationship with the federal government. Listed in the National Register January 11, 2019.